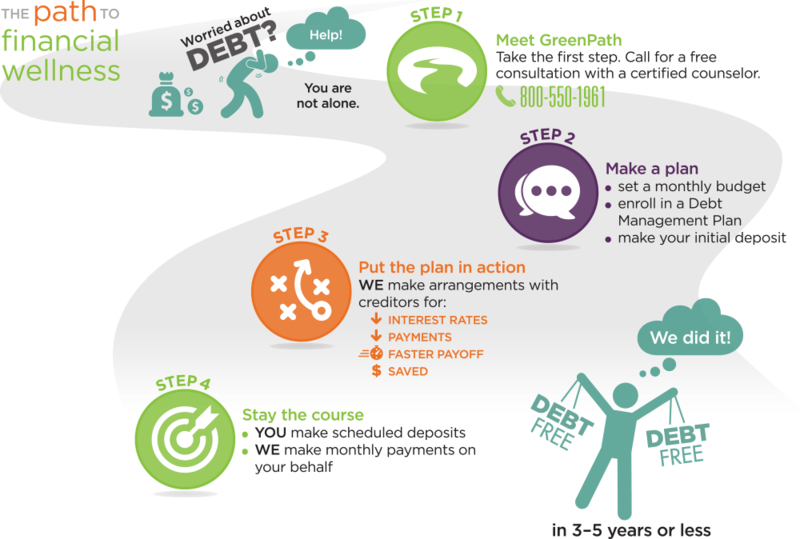 Learn how to pay off your debt with GreenPath! We’ve built one of the nation’s most trusted debt management programs. We have more than 60 years of experience supporting people to eliminate debt. A Debt Management Plan is designed to pay off the entire amount that you owe, usually within three to five years. It can help you pay off credit card debt faster, and save money on interest charges. When you call, you’ll talk to one of our NFCC-certified credit and debt counselors. We’ll review your financial situation together, and make a personalized plan to get your finances back on track. We’ll explain the options and give you the information you need to make a choice that works for you. Call us today to get started. It’s free, confidential and no-pressure. When you sign up for a debt management plan, you have an entire team of GreenPath people behind you. You’ll get Information and support, when you need it. We’re here for you at every step of the journey. You can call us anytime during business hours to reach a debt counselor if you need advice, or to talk to your Client Success Team about your account. You also have instant access to account information through our online debt management portal. You also have access to a community of others who are paying off their debt in a private online group. This positive community of support is a great place to ask questions, share tips, and get friendly moral support to make your journey easier. We believe in our clients 1000%, and we love nothing more than seeing you succeed. Last year, we helped more than 50,000 households pay off nearly $2 million in debt. We do this by putting people — you! — at the center of our work. Our counselors receive training in compassion and empathy. It’s our job to listen without judgment, and to treat our clients with respect. Which creditors do you work with? We work with most creditors throughout the U.S., including banks, credit unions, retailers, medical providers, auto finance and collection agencies. How much does it cost for a debt management program? Can I still use my credit cards on a Debt Management Plan? Since the goal of a debt management program is to pay off debt, the credit cards enroll in the program will be closed. Most creditors will usually allow you to continue using one card for emergencies and travel. Does GreenPath work for the banks? GreenPath is a neutral third-party that works in your best interest. Many creditors support our work because they believe it results in positive, long-term outcomes. Are debt management plans different from debt settlement?